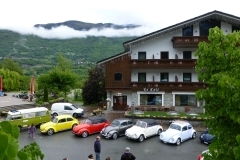 From 17th to 19th of May 2013 Francesco organized a tour in Valle d'Aosta which is the part in Italy towards France in the Mountains. Local wood art Museum in Cretes, Parc Animalier in Plan d'Introd as well as the Fort Bard. On the way back home I was lucky to enjoy a paillard di vitello alla griglia as well as a meringhe con gelato vanilla for desert in Gravesano near Lugano at the Osteria del Reno. Incredible tour all over.